During the live interview Jim asked Mark Valinsky how as a multi-talented entrepreneur you can stay focused in multiple careers, properly brand yourself and communicate to your public without confusion. Jim DeCicco is the show’s creator and host www.mm4artists.com who also has a creative career which includes being an award winning musician, music producer, and entrepreneur for more than 20 years. Jim’s creative work has garnered over a dozen industry awards for independent artist production in addition to studio work with many well known recording artists. Jim’s unique combination of metaphysics, simple business techniques and “street sense” has inspired hundreds of artists and professionals into greater success in not only art, but also in their finances, their relationships and their health. In 2005, the HealthyLife.Net Radio reached an audience size of 8,522,455 listeners. HealthyLife.Net continues to grow in worldwide audience to 108 countries and now reaches 1,240 cities in all 50 U.S. states in America. HealthyLife.net is syndicated to 52 channels of distribution and simulcast 24/7. “A creative artist while in medical school Mark helped institute and develop the video teaching lab where he was a producer, cameraman and editor on 12 teaching videos. In the years following his graduation in his career as a surgical podiatrist, Mark helped advance many of the philosophies and techniques of Minimal Incision (Minimal Traumatic) surgery as applied to the foot far before it was popular and has 8 published researched papers. He has also traveled throughout the United States and the world lecturing, including to Madrid, Spain and five visits to the People’s Republic of China.” Wrote Olga Lindsay on Mark Valinsky IMDB. Something was missing and Mark wanting more out of the rest of his life so he moved to Los Angeles to pursue his passion of producing, acting and photography. Once while talking with Tom Cruise, Tom asked Mark why he would give up being a successful doctor and switch careers to act and produce, Mark’s answer to Tom, “You’re having too much fun without me”. With a great respect for classic Hollywood Mark is interested in all aspects of the film and television industry. Mark brings to the entertainment field a certain degree of professionalism and determination along with a good mixture of mid west friendliness, dependability and ethics combined with a proper dose of East Coast aggressiveness, plus a natural pursuit of determined excellence to get things done. Because of their accomplishments in many fields, Mark points out his respect and admiration for people like Clint Eastwood well known and respected for his many diverse talents – politician, composer, musician, film director, producer, and actor. While many believe a secret to success is to do one thing well, Mark Valinsky feels you can also be successful by doing the many things you are passionate about and doing them well. The statement “A jack of all trades, a master of none.” really doesn’t always apply, nor should it. Mark Valinsky, legal name Mark Steven Valinsky is the eldest of 6 children was born in Chicago, Illinois to Harry and Beckie Valinsky. When he was 5 years old his family moved back to his parent’s hometown of Rochester, New York where he was raised. While back in high school Mark produced a number of events, and would also act and make films with his friends, but his love for imagery creation came about from a visit to The Massachusetts Institute of Technology, MIT where he first met and was shown the research lab of the world famous, Professor Harold Edgerton, who did pioneering research in stroboscopic (stop action) photography (the bullet through the apple and playing card). Mark went off to college at Ohio State University, later to S.U. N.Y. at Buffalo, and finally back to Chicago, Illinois to earn a Bachelors of Science degree and Doctorate of Podiatric Medicine from The Illinois College of Podiatric Medicine. During and shortly after podiatry school, Mark photographed the live concert performances of such Classic Rock and Roll bands as The Rolling Stones, Led Zeppelin, The Eagles and others, and has photographed many celebrities on the red carpet and at other prestigious events. To find photos and more information visit http://www.imdb.com/name/nm1828054, www.MarkValinsky.com, www.MarkValinskyPhotography.com, www.ClassicRockPhotography.com; www.HeadshotExpert.com; www.ValinskyMediaGroup.com;www.WithoutAVoiceTheMovie.com; and www.SudanHope.org. 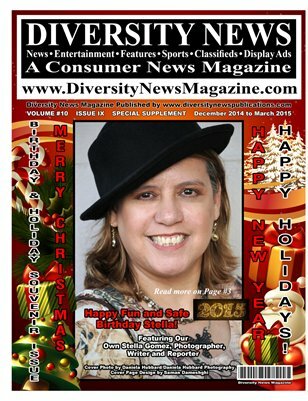 Editor’s Note: Dr. Mark Valinsky, doctor, actor, producer, photographer, author is a regular contributor to Diversity News Magazine and our other online publications. He contribute photos and is a media/pr consultant for us. We want to thanks and wish him the best.